62.03" x 70.30" x 95"
Our Exhibit Component collection was developed by seasoned exhibit space designers. The collection reflects universal solutions that would work well alone or with existing exhibit spaces. Add a single Tower or put one in every corner of your exhibit. 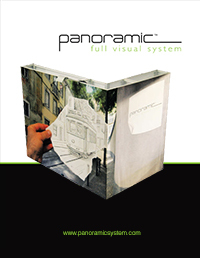 Since Panoramic™ only shows graphics, your artwork will carry the look and feel of any exhibit. Add some simple accessories and your towers become useful workstations compatible with any environment.